South Carolina has the great history of stopping gambling expansion especially when it comes to the online gambling and online poker. In fact, playing gambling with machines and dices are banned by the South Carolina authorities. You can’t even play board games such as Monopoly or other famous games such as cribbage. The gambling laws were made in 1802 but they were revised in 1980 to prevent any loop holes in the law system. In 2013, illicit online poker industry was tracked down by the authorities and they conducted special operations to remove poker from the state. Till 2013, there were no bills made or represented for debates by the law makers and there is no hope that laws will change significantly until the next elections. Rep. Bill Herbkersman (Republican) from Bluffton made proposal that he is going to make home based poker and other social card games legal. Immediately, many conservative members of the Senate have opposed this statement as they are strictly against the online poker. Many newspapers also published many articles that suggest that this step will lead the state for legalizing gambling. The Cherokee are making too many efforts to get approvals of state authorities for opening a casino. But Gov. Nikki Haley has promised to reject the proposal without seeing the benefits that state can enjoy such as great revenue. There are several cases where police of South Carolina has made raids for stopping people from playing online poker. In many cases police has used SWAT teams to raid in the houses of normal people that were sitting with their friends. In 2006, SWAT team arrested more than 20 people with the charges of playing poker. In that raid, 72 year old man was killed by the several fires from policemen. The police teams also raided some conservative people who were suspected for corruption charges. The state Alcohol Law Enforcement said that there was illegal poker game that was taking place during the raid. It stunned the people of South Carolina because that was not expected from the conservatives. Many online poker lovers hinted that conservatives were demanding huge bribes for supporting the online poker legalization. It is very clear that many officials play poker and other gambling games on occasions and that has lead to the situation where police officials are not sure what they should do. SWAT team for stopping poker tournament and huge raids in normal people house! Really there are lot many things that online poker industry have to do if they are seeking for making online poker legalized by the state. Government is strictly against the online poker and only if all the casinos of USA and people of the state works together then only there is hope that one day online poker will be legalized by the state. South Carolina is a state where you can be arrested for keeping pack of the cards and face serious legal trials. 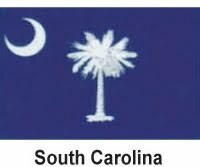 The gambling laws were proposed to change but senate of South Carolina refused to vote in the favor of changing any laws.